You’d think the Maze would’ve been enough of an adventure. A group of boys lived in the Glade, a green valley surrounded by intimidating stone walls that trapped them in every night, and they never knew when their supplies would run out or when the next new recruit would appear. Each night, a select few ran the Maze, trying to find a way out while evading horrible, mechanical creatures called Grievers whose venomous attacks would leave a boy incapacitated and feverish. When Thomas (Dylan O’Brien, “The Internship”) appeared, became a Maze Runner, and eventually led the boys to an escape of the Glade and through the perilous Maze, the boys thought their turmoil had passed, that their torment was through, and they were finally safe. Unfortunately for them, the secret organization WCKD (cleverly known as WICKED) has other plans. At the end of “The Maze Runner,” Thomas, sole-Maze-girl Teresa (Kaya Scodelario, “Clash of the Titans”), Minho (Ki Hong Lee, “Everything Before Us”) and the small group of surviving boys are rescued by a group of rebels. Now, in Maze Runner: The Scorch Trials, they are rushed on helicopters through a windstorm to a fortress where they’re given showers, hot meals, and beds and discover many other boys and girls like them — WCKD, we learn, had other Mazes and other experiments. Thomas is questioned briefly by rebel leader Mr. Janson (Aidan Gillen, “Calvary”), who promises them protection, and transport to a sanctuary where they can live in safety from the Cranks, people infected with the Flare — a disease that renders the victim feverish, zombie-like, and extremely dangerous. Each day, a group of young men and women are called, brought through a steel door, and disappear. Those remaining behind are promised their turn, but when Thomas investigates and discovers something much more sinister than they ever imagined, the boys and Teresa escape the fortress and enter the Scorch. Out in the desolate wasteland, the escapees encounter sandstorms and vicious lightning strikes, vast distances between shelters, and, of course, Cranks. Searching for the Right Arm, a resistance group rumored to be hiding out in the mountains, the group remains focused on their goal of defeating WCKD and stopping the many terrible experiments being performed on the young. 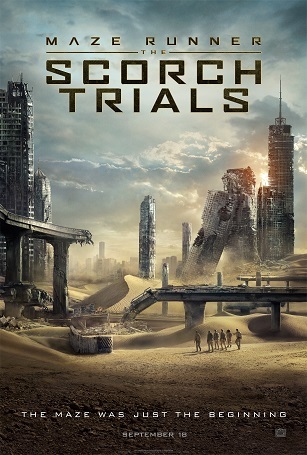 Adapted from James Dashner’s second novel in The Maze Runner trilogy, Maze Runner: The Scorch Trials is a story mixed with tension, adventure, and a little bit of “Mad Max” thrown in for good measure. As another YA series based in a post-apocalyptic world, “The Maze Runner” and its sequel are fighting against YA dystopic fatigue from movie-goers, and it’s successfully holding its ground because Dasher’s characters are not “The Hunger Games” or “Divergent” clones, although they struggle through similar trials (surviving attacks from adults, trying to find sanctuary from a greater evil entity). Thomas and his allies are fighting against Dr. Ava Paige (Patricia Clarkson, “One Day”) who claims she’s trying to save humanity, not exterminate youth or rule tyrannically. Where those other YA trilogies are determined to squash down rebellious young people, this one presents some ambiguity about WCKD’s motives, especially since Thomas used to work with and for them. Clarkson’s soft-spoken Paige is simultaneously calming and frightening as she speaks to Janson about her intentions, making her something other than your typical bad guy kingpin. Her demeanor contrasts starkly with Dylan O’Brien’s Thomas whose kinetic energy shows his commitment to bringing WCKD down while he struggles with his fragmented memories regarding his own role in their plans. To go with Thomas, new characters and new dangers abound in Maze Runner: The Scorch Trials, although there are some distinct changes in the adaptation from Dasher’s novel — some I’m very disappointed to see left out of the script. Notably missing is some character depth, much of the complexities between characters and more than a fair share of shocking moments. Similar liberties (although to a lesser extent) were taken by returning director Wes Ball and screenwriter T.S. Nowlin with the “The Maze Runner,” so these omissions aren’t show-stoppers for audience members who have read the books (and most certainly not for those who haven’t). Such is the limitation to taking page to film. What’s good though, is director and writer are returning to work on the final chapter, “Maze Runner: The Death Cure” (to be released in 2017), so fans of the series will know what to expect. Often when multiple directors are given the helms to these hugely popular YA adaptation franchises an uneven tone results. But that’s not all — it gets better yet still. They’re also saying TRILOGY — so this is one three-book series that won’t become four movies. And by bucking the trend started by Harry Potter with “Harry Potter and the Deathly Hallows – Part 1” and “Harry Potter and the Deathly Hallows – Part 2,” Maze Runner: The Scorch Trials fits right in as a fine “middle film” — it moves the story along, it brings us new and more grueling challenges, and it keeps us excited for the next installment. Yawn. I’m just dead tired of these lame adaptations. standard action movie. lots of running. suffers from air ducts people can crawl through. I’ll admit I liked it and I’m likely to watch the final episode. There’s some silly moments to this but overall its got good tension and thrills and Dylan O’Brien makes a good protagonist. It’s heads and shoulders better than Divergent and Giver and others. Dylan O’Brien always has his mouth half open like he is in a constant state of exasperation. It’s been an entertaining series so far. If I wanted to watch another race across a desert I’ll rewatch Fury Road before watching this childish crap thank you very much. They’re Cranks, man. Know the difference! It goes a lot farther than just “missing some character depth, much of the complexities between characters and more than a fair share of shocking moments.” If I recall correctly, they pretty much left out all the plot developments from the book. I liked the first movie more. Scorch has some interesting action but it is mostly kids running and yelling at each other to keep moving or hide. The needs of the many outweigh the needs of the few. I don’t see the problem with sacrificing some kids to develop a cure to save humanity. What am I missing? Self preservation is a basic human instinct. You’re not an adolescent girl? Got dragged to this last night. I will never forgive nor forget. Never ever. If you take the ‘Maze Runner’ portion out of the title you have a neat little post apocalyptic zombie movie.